Music • She'll lead the Utah Symphony in music of Tchaikovsky, Mozart and Williams. The Utah Symphony&apos;s Deer Valley Music Festival continues with performances in two Park City venues: St. Mary&apos;s Catholic Church, where a chamber-size ensemble will perform traditional orchestra fare, and Deer Valley Resort&apos;s Snow Park Outdoor Amphitheater, with fare befitting a more casual setting. Associate conductor Rei Hotoda will lead all three programs in this eclectic week. More information on all festival concerts is at deervalleymusicfestival.org. 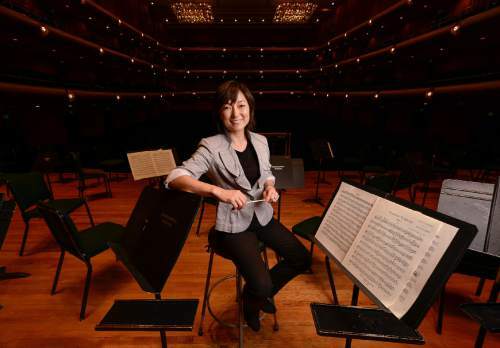 Hotoda has come full circle with the Utah Symphony. Just over a year ago, she made her debut as the orchestra&apos;s associate conductor in a performance at St. Mary&apos;s Church, conducting a Mozart piano concerto from the keyboard. She&apos;ll play and conduct another Mozart concerto  No. 9 in E-flat, nicknamed "Jeunehomme"  at St. Mary&apos;s on Wednesday. "It has been quite the year and a whirlwind season," Hotoda said in an email. "Working with [music director] Thierry Fischer and the amazing players of the Utah Symphony Orchestra and being a part of the 75th-anniversary season is something I am both proud and in awe of. I had the remarkable opportunity to go to Carnegie Hall with this ensemble, work with them on recordings, lead and design some incredible programs and perform for nearly 50,000 teachers and students throughout the state. "The level of trust, respect and support I feel from the audience, the musicians in the USO and the administration is truly wonderful. Add to this, the warm welcome I received from the orchestra and the community, all while surrounded by such natural beauty, has taken me to the next level both personally and artistically." Hotoda has conducted several outdoor concerts this summer, a challenge she called "exciting, exhilarating, inspiring." "You never know if the wind is going to kick up or the heat is going to top 110 or if the sound system is going to go awry, but you do know that performances such as these are gathering places for a different and special kind of community," she explained. "There may be someone in the audience who may not feel comfortable coming to a concert hall or families with young children who want to share the experience together or perhaps individuals who may be hearing an orchestra for the first time. This is truly something that makes all musicians play at the top of their game." The challenge she&apos;s tackling Wednesday  conducting from the keyboard  "is a chamber-music experience on steroids," Hotoda said. "There is nothing quite like it. It is electric, exciting and beyond words. Being able to incorporate two of my passions  playing and conducting  is amazing. Don&apos;t get me wrong; doing both is the ultimate juggling act, but a very rewarding one. … The level of trust between the soloist and orchestra, while playing in the orchestra, is much different than that of being solely on the podium." Also on Wednesday&apos;s program are Honegger&apos;s "Pastorale d&apos;ete (Summer Pastoral)" and Poulenc&apos;s Sinfonietta. When • Wednesday, 8 p.m.
"It is so inspiring, so beautiful, and it says so much," Hagen, 23, said in an email. "I hear such a clear narrative that goes from the very opening of the first movement to the very last note of the last movement, and I think everyone who really listens to it hears that narrative. From beginning to end, it never stops being interesting, because there&apos;s always such purpose behind every note. There is considerable flash and dash, but it&apos;s never over the top  there is always a purpose." He&apos;s thrilled to be playing the showpiece for his hometown crowd. 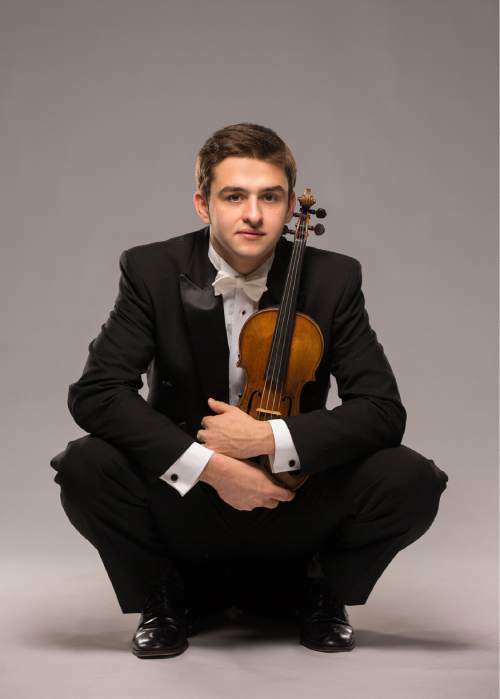 Hagen has a long history with the Utah Symphony, from a performance on the annual Salute to Youth concert when he was 9 to his most recent concerto engagement in 2010. "My fiancée and I were at their Carnegie Hall concert just a few months ago, and it was fantastic," he noted. "I have tremendous respect for the orchestra as a whole and for the individual musicians that I know. We are very lucky to have such a great orchestra in Salt Lake." Hagen plays a violin made in 1675 by Andre Guarneri. "It&apos;s not a del Gesù, but it&apos;s the Guarneri family so it&apos;s pretty similar-sounding," he said in a Tribune interview last year. "It&apos;s got sound to spare." The violinist said he&apos;s been "having a blast" the past few months playing recitals in France and Belgium, chamber music in Germany (with heavy hitters Steven Isserlis, Christian Tetzlaff and Gidon Kremer) and a concerto date at the Aspen Music Festival in Colorado. There&apos;s more excitement to come: Hagen is getting married later this month and beginning studies at Kronberg Academy in Germany shortly thereafter. "Things are going exceptionally well," he said. Friday&apos;s concert also includes Shostakovich&apos;s Festive Overture, the Polovtsian Dances from Borodin&apos;s "Prince Igor," the Adagio of Spartacus and Phrygia from Khachaturian&apos;s "Spartacus" and the traditional performance of Tchaikovsky&apos;s "1812 Overture," punctuated by live cannon fire from the Cannoneers of the Wasatch. Hotoda conducts. Hotoda and the orchestra close the week with music from some of John Williams&apos; most popular film scores: "Star Wars: The Force Awakens," "Harry Potter and the Sorcerer&apos;s Stone," "Raiders of the Lost Ark," "Jurassic Park," "Schindler&apos;s List," "E.T. the Extraterrestrial" and "Saving Private Ryan."